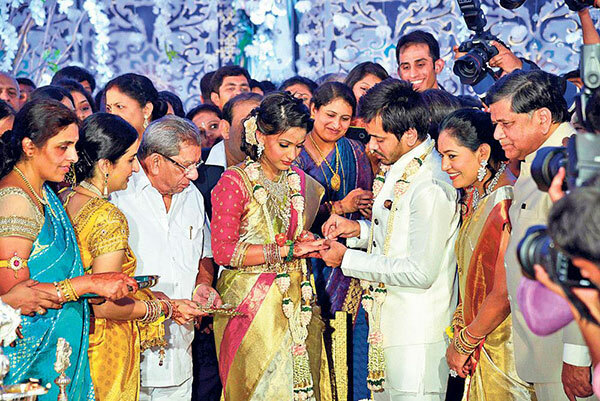 Davangere: Minister Shamanur Shivashankarappa’s granddaughter Anchal and Jagadish Shettar’s son Prashanth exchange rings during their betrothal ceremony in Davangere on Monday evening. Shivashankarappa, Shilpa Shettar, Jagadish Shettar and others are present. Marital ties began when party lines blurred. That was the highlight of a betrothal ceremony which took place in the city on Monday. Anchal, the granddaughter of Shamanur Shivashankarappa, the octogenarian Congress leader and minister, got engaged to Prashanth, son of BJP leader and former chief minister Jagadish Shettar. For a change, it was bonhomie between the leaders of the two parties, who always go for each other’s jugular. While Shivashankarappa is the Horticulture and Agriculture Marketing Minister, Shettar is the leader of the Opposition in the Assembly. Anchal is the daughter of S S Ganesh, the industrialist son of Shivashankarappa. The engagement ceremony was held in a specially erected pandal on 10 acres of land on the premises of the Bapuji community hall. Seating arrangements had been made for 10,000 people at the venue. Over 500 cooks from Davangere, Bengaluru, Shivamogga and Thirthahalli prepared a variety of dishes for the guests. Shivashankarappa’s Cabinet colleagues Social Welfare Minister H Anjaneya, Water Resources Minister M B Patil, Labour Welfare Minister P T Parameshwar Naik, Co-operation Minister H S Mahadeva Prasad, Transport Minister Ramalinga Reddy, former chief minister B S Yeddyurappa, former ministers Murugesh Nirani, C T Ravi, Katta Subramanya Naidu and former Supreme Court judge Shivaraj Patil were among the guests who attended the ceremony. Shivashankarappa’s other sons S S Mallikarjun, S S Bakkesh and close relatives of Shivashankarappa and Shettar were present at the function. Shivashankarappa is an industrialist and educationist who runs a chain of educational institutions ranging from kindergarten to professional courses in Davangere. He is the permanent treasurer for the Karnataka Pradesh Congress Committee.